This is the Mists of Pandaria Release (5.0.4) version of the addon. If you need the Cataclysm (4.3) version, download version 1.08 instead. HolyTrinity is not supported for Warlords of Draenor, Legion, and beyond. Sorry! I recommend the excellent WeakAuras for your Holy Power and cooldown display needs. 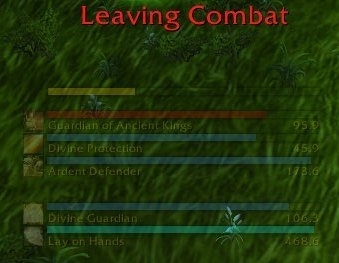 A minimalistic paladin UI for displaying Holy Power and cooldowns, based on suicidalkatt's excellent SoulBurned warlock addon. 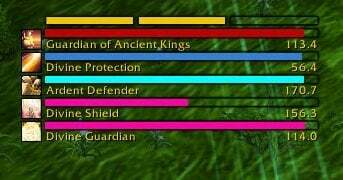 Cooldowns can be enabled/disabled individually and all bars are configurable by order/color/texture. SharedMedia supported. Added option to hide the Holy Power background outlines. Mists of Pandaria Beta release. Added support for 5 Holy Power (enabled by default). Changing this option requires ReloadUI. Added new offsets to move Holy Power 4 & 5 independently. Guardian of Ancient Kings was split into 3 spell IDs. This may cause issues. Removed Word of Glory as it no longer has a cooldown. Removed Divine Sacrifice, Aura Mastery, Zealotry, and Divine Favor. Added Hand of Purity, Devotion Aura, Holy Avenger, Speed of Light, and Fist of Justice. Added Execution Sentence, Holy Prism, and Light's Hammer. Disabled audio preview button as it is currently broken. Added option to fade at zero holy power. Removed Holy Radiance as it no longer has a cooldown. Added Word of Glory (Holy should leave this disabled). Fixed all instances of nil duration errors (hopefully). Holy Power will now refresh properly after a loading screen. Added optional sound effects for when you hit 3 Holy Power. Fixed a bug where others paladins' abilities could trigger errors. Added Holy Shock support by request (disabled by default). Corrected the default Holy Power spacing to be left-to-right (negative values flip the spacing direction). Fixed a bug where timers would expire with nil durations and produce LUA errors. Added configuration options for spacing the Holy Power bars. They can now be stacked vertically and reversed. Added configuration options for resizing the Holy Power bars. This stretches the texture and may not look ideal in all shapes and sizes. Added checkbox to enable collapsing cooldowns (enabled by default). Fixed a bug preventing Light of Dawn and Divine Favor from working. Cooldown anchor can now be offset from the Holy Power bar. Cooldown spacing can now be adjusted. Added Divine Favor and Light of Dawn. Added checkbox to flip cooldowns to above instead of below. Added checkbox to disable the Holy Power bar (requires ReloadUI). I'm hearing the newest patch finally broke something. I have no active accounts currently, but I will probably look into it closer to WoD release. In the meantime please put up a log of whatever error you are encountering and maybe I can put out an untested fix. Anyone else having trubble with this in the new patch? i don't know if anyone else is interested, but based on my UI, i decided it'd be best to not have spell names, cd countdown, or icons for the cooldowns. no errors, it at least works for the two items i show cooldown bars for (holy shock and holy prism), and in fact, it's gotten rid of every lua error i had at login. i'd back up your HolyTrinity.lua file first, your mileage may vary. Is there an option to make the background for holy power completely transparent, so they don't show up as empty outlines when there isn't a holy power inside them? On the older version, I had renamed the empty.tga file to something else, and it gave me the result I was looking for, but in the new version, doing that creates a large green rectangle. Does anyone know of an elegant solution for this? I looked into this and couldn't find an easy way to do it manually, so I added an option to the config. I'm pushing a minor update today, but the previous version still works with 4.3. Are you still planning to update this addon for 4.3? Just asking so i know if i should look for a replacement. (It does still work fine tho so no real rush just curious). Make the Holy Power meter appear ONLY when i have 1,2 or 3 Holy Power, and make it fade 100% out when my holy power is empty? I think that should be possible. I'll put it on the list for 4.3.
so sad i post again, above my own post above my own post! I would like to see HolyTrinity shows up any yet selectable cooldown to be set to flicker (maybe in some adjustable transparency, with the design HolyTrinity now provides, full bar and symbol) if its ready to use again. Last edited by Morwo : 05-12-11 at 04:40 PM. i just found on PowerUp http://wowinterface.com/downloads/in...8-PowerUp.html, a similar design to holy trinity. while i won't change to PowerUp because of HolyTrinitys Cooldown bars, i wonder if u can implement the HolyPower cooling down out of fight, like in PowerUp. Psi love this AddOn and keep up the good work. Just wondering if you could add an Inquisition cool down to the list. Think it would really be helpful. Thanks.